Government has set timeframes for the partial privatisation of some of the State-owned enterprises (SOEs). The timeframes range from 12 to 24 months. 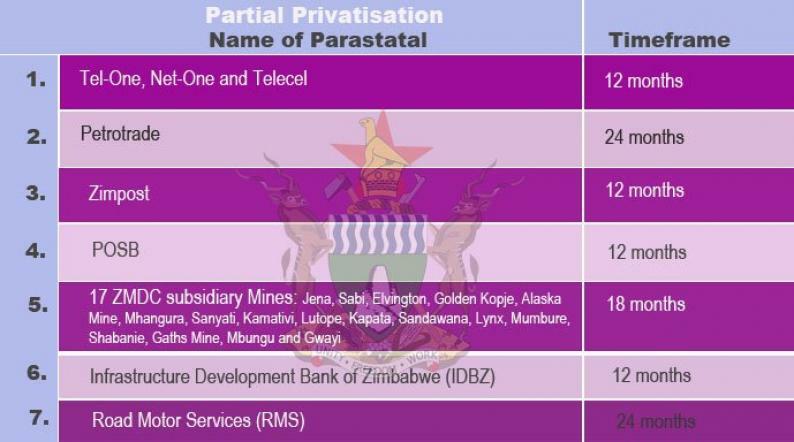 The partial privatisation of TelOne, NetOne and Telecel will take 12 months to complete. In the Mobile Network Sector, the state-owned enterprises are failing to keep up with private owned entities such as Econet which has dominated the industry, reaping huge revenues while others were struggling. With ZARNet, Africom and Powertel offering similar services yet at a much smaller scale than established private enterprises, the merging of the three may make them big enough to compete with other giants, particularly Liquid Telecom. The government wholly owns TelOne and NetOne while it holds a 60% stake in Telecel. In a bid to do away with duplication, the government will merge Zarnet, Powertel and Africom to create one company while the Postal and Telecommunications Regulatory Authority of Zimbabwe (Potraz) and the Broadcasting Authority of Zimbabwe (Baz) will be combined to create one telecommunications regulator. NetOne is reported to have begun talks with Telkom about a possible joint venture, the head of the country's privatisation agency said. It is one of at least 35 companies earmarked by the state to be offered to private investors. Telkom has so far declined to comment on whether it is in talks. The company evaluates business opportunities "in line with our ambition to invest for growth and generate returns", it said. TelOne is the country's incumbent fixed line operator, while NetOne competes with Econet Wireless and state-backed Telecel in the mobile market.